Dolls dancing splendidly on a float during a parade, serving tea in a tatami room, or firing an arrow from a bow at a target; these dolls are known as Karakuri, and they have a long history in Japan. Karakuri dolls developed rapidly in the first half of the Edo period. Born from technology independently developed in Japan, they later incorporated technology from rifles and mechanical clocks brought to Japan through trade with Europeans. The shift from a warring era to a peaceful era is also thought to have played an important role in spurring development of these dolls. In the second year of the Kanbun era (1662), a public performance by Takeda Lmi featuring Karakuri dolls in Osaka's DMtonbori was very popular, spurring interest in Karakuri in Edo, Owari, and the rest of Japan. In Edo, the dolls were used as part of Kabuki performances; in Kansai, to create Japanese puppet theater known as Bunraku; and in Owari, as fixtures on parade floats and in private homes, where they performed parlor tricks such as serving tea. 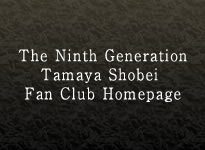 Successive generations of the Tamaya Shobei family helped propel development of the dolls used in Owari. During the Tōshōgū Festival in the eighth year of the Kyōbō era (1733), the festival float for Tenma-chō (Naka Ward, Nagoya) known as Rin'naseisha was used in the parade for the first time. The original float featured the Chinese holy man Rin'nasei, a Chinese boy chasing after a crane, a Chinese boy waving batons, and a crane which moved its head back and forth while flapping its wings. Tamaya explained to the townspeople how the dolls were made and demonstrated how to operate them. 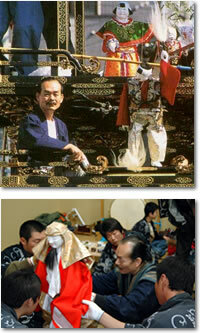 The puppeteer was asked to perform again at the following year's Tōshōgū Festival, which led in turn to his decision to relocate to Nagoya's Tamaya-chō (Naka ward) and add the toponym "Tamaya" to his name in order to associate himself with the neighborhood. From this moment on, the Karakuri tradition received continual support in Owari and the surrounding areas. 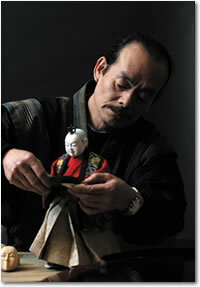 The current Tamaya Shobei (real name: Takashina Shōji, born in 1954) is committed to spreading knowledge of Karakuri culture and manufacturing techniques around the world.